Promotional pink lemonade legacy lip balm w/white cap spreads a cool, enriching and silky effect over lips. It delicately mimics the taste of cool pink lemonade largely consumed during hot scorching summers. This lip balm banishes dryness and locks moisture over lips. It soothes lip tissues affected by weather and heals burnt, cracked and chapped lip skin. Health Quotient – PABA free. Includes light mineral oil, aloe oil, beeswax, vitamin E, coconut oil, and many more well-known and high quality exfoliates. Pink lemonade flavor. No harsh colors, flavorings or quality enhancers used. Cruelty-free. 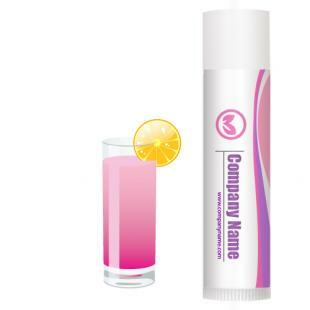 Directions – Apply pink lemonade thickly over bare lips or under the lip make up. Use it thrice or at least five times a day for achieving desired results. Gifting Favors – Promotional pink lemonade legacy lip balm w/white cap make a great summer healer! It remains largely affordable and can be sought for gifting by all big and small budget marketers.